Swain Chiropractic is the community’s health and wellness expert for your family. We have been serving the Altoona and Des Moines metro area with clinical excellence and experience for 20 years. We know it is essential for each family member to be checked and adjusted to connect the brain and body. We know that the health of a pregnant woman is vital because the care we provide benefits both mother and baby. Proper nervous system and spinal function is crucial to the development of your baby and essential to the well-being and comfort of mom. 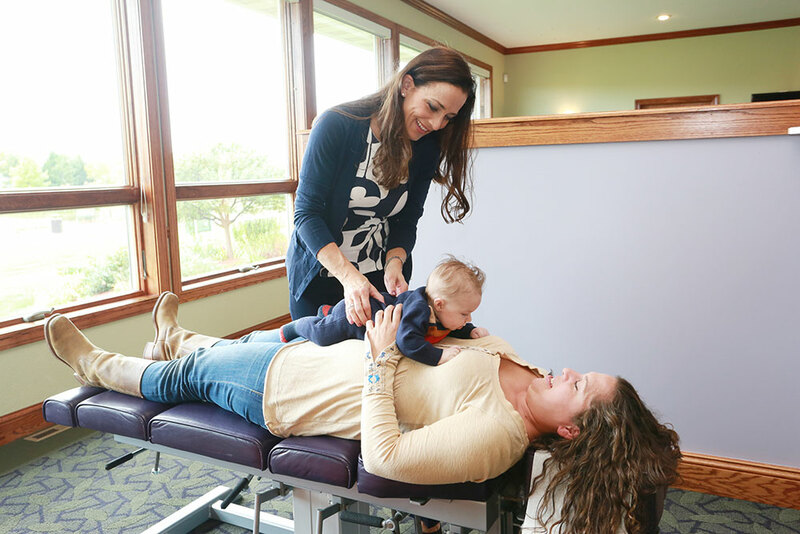 The effects of chiropractic care during pregnancy are extensive and reach far beyond the treatment of pain. Chiropractic care ensures the alignment of the pelvis and spine to allow proper motion and function. Maintaining this alignment throughout pregnancy can improve the health and ability of the mother to have a safe, natural birth. The modern birth process can be one of the most traumatic events that a person will endure in their life. Birth is by nature an incredibly safe and natural process, but unfortunately, many health care providers today choose to view pregnancy as a “medical condition.” A woman’s body is perfectly designed for the birth process, and in most cases difficulties only arise if the mother is not functioning at 100%. Dr. Kari believes that it is essential to have your child checked for subluxation as soon as possible after birth. Subluxation is a misalignment or lack of motion within the spine that results in stress and ill health in the body. C-sections and other birth interventions increase the risk of subluxation in infants, although subluxations are often present even following an ideal natural birth. Chiropractors are the only doctors trained to detect and remove these subluxations. As your newborn grows their spines continue to undergo many forms of trauma as they transform into toddlers and learn to crawl and walk, play, and tumble and fall. These only continue as your child grows and becomes involved in sports and other activities. Many of these falls and minor injuries result in subluxations which are not apparent to the untrained eye but are easily detected by a chiropractor and removed through gentle, safe spinal adjustments. Posture is a very telling sign of the health of a child’s spine. If your child has poor posture, that is a strong indicator of subluxation in the spine. Even if there does not appear to be an issue, subluxation may still be present. Prevention is the most effective form of care, and it is most beneficial to start young so your child can grow and function at their full potential and truly be well. Another vital piece to our specialized pregnancy and pediatric care is providing parents and children with complete wellness care. We are committed to being your resource for family health and wellness. Dr. Kari, Kristen, and Loral are here to answer your questions and share our expertise in wellness education. Through our workshops and one-on-one instruction, we educate our patients on topics from prevention, nutrition, exercise, stress reduction, supplements, and any other component of wellness.